It was a long bike ride to the river and I remember sweating profusely by the time we crossed the wooden bridge that spanned the dark current. After walking our bikes a few feet into the wood, we hiked single file down the trail outlined on the napkin. The conifers were closely packed on either side of the narrow path, and I could smell the balsam in the heavy June air. As the sound of the current filled our ears, Gilroy was unable to contain his excitement. Pushing past me, he scrambled down to the side of a waterfall that stretched across the river. A few seconds later, I swung Fogerty’s cooler onto a picnic table that was set in a small clearing beside the stream. Donnie hurriedly rigged the old cane rod he had purchased at a yard sale the previous summer. “It’s just like Fogerty said!” he yelled back at me. The spray from the falls felt good after the long bike ride. I walked over to a large boulder. A bronze plaque bolted to its side commemorated a visit to the river by President Eisenhower. “Fogerty says they stocked this pool with so many trout Ike could’ve walked across their backs to get to the other side.” Gilroy was talking while knotting a Black Ghost to his line. I drew closer to the long run that spread out below an outcropping of boulders polished smooth by what the napkin confirmed was Little Boy Falls. Donnie cast the Black Ghost into the white foam at the bottom of the falls while I strung line through the eyes of an eight-foot Leonard fly rod that was a hand-me-down from my great-uncle. As the current took hold of the streamer, he stripped back line, imitating the action of an injured baitfish. On his third cast, a salmon, as big as the one hooked by my grand in Warden’s Pool, rocketed through the surface. Yet to make a cast, I dropped my rod and grabbed the net that hung from a clip on the back of Gilroy’s fishing vest. Wading behind him, I watched the fish jump a second and then a third time. It seemed like an eternity before I was able to slip the net under the salmon’s side. I remembered to hold the salmon under the water the way my grand had taught me while allowing it to regain its strength. We marveled at the fish’s beauty. Its silver-and-black scales reminded me of the type of armor I’d seen in a book my mother liked to read to me about King Arthur and his Knights of the Round Table. Careful not to injure it, Gilroy gently removed the hook before we slid the big salmon back into the cool water below the falls. During the next few hours Donnie released two more salmon, each smaller than the first, while I wandered farther down the trail, taking a few small brook trout from a wide run known as Landing Pool. After lunch, we switched positions. I was checking Fogerty’s watch, about to call out to Gilroy, to tell him it was time to head back, when he began to frantically holler my name. While I scrambled over the boulders beside the shoreline, my leaky hippers made squishing sounds each time my feet hit the ground. Gilroy’s rod was bent forward, vibrating with the life force on the other end of the line. “Have ya seen ‘em yet?” I cried while wading toward him. “Only his maw. After that he went deep and stayed there.” Donnie took back line, but after three turns of the reel, the fish powered across the deep pool, on a long run that caused the reel to sing out in frustration. “Seems more pissed than scared.” Sweat saturated the back of Gilroy’s shirt. “Bigger than the salmon, for sure,” I muttered, my voice lowered to a reverential whisper. I watched the fish take more line. It was nearly into the backing. Donnie worked the trout, gradually reclaiming much of the line previously lost while I strained to catch a glimpse of the Leviathan. “Sonavabitch,” cried Gilroy, when the brook trout suddenly broke through the surface. I was sure it was the biggest fish we’d ever see however long we might live. It made the salmon look like a smelt. No way it’d fit in the net, I thought, afraid to voice my concern. “You two belong to those bikes up the trail?” An angry voice suddenly called out. Startled, the two of us turned at the same time to find two men breaking out of the forest beside the stream. Donnie turned back to the fish while I continued to stare over my shoulder. Shiny gadgets dangled from the fly vests of the two men. The shorter one wore a wide-brimmed hat. His belly pressed against his chest waders. Rivulets of sweat trickled down the guy’s cheeks. The shadow cast by the brim of a dark blue baseball cap hid the taller one’s face. Both men held expensive graphite rods in their hands. “Time to go boys,” the man under the cap called out. “Don’t make us call the warden.” The fat man dropped his rod in the grass and waddled onto a cobble bar that spread out into the river. Gilroy was trying desperately to bring the fish to his side while leaving me to decide whether to bend forward with the net or engage the two men. “Didn’t you see the signs above the gate? You’re trespassing!” The taller man waded past his companion. He too had abandoned his rod on the bank. “We didn’t use no vehicles,” Donnie called back weakly. I could now see the face of the man with the baseball cap. Deep creases cut through his brow. Combined with skin that was tight against his high cheekbones, the guy reminded me of one of the dead brought back to life in a movie Gilroy and I had seen. The zombie was almost upon us. His sweating companion huffing and puffing a step behind. “C’mon mister,” was all I could think to say. “NOW!” spit out the fat man. As the zombie with the cap reached for my arm, Donnie momentarily looked away from the fish. That’s when the trout turned, falling upon the horsehair-thin monofilament connecting Gilroy’s line to the Hornberg. Hardened by age, the fish’s jaw was impervious to pain, but the unrelenting force that had pulled it ever closer to shore had suddenly ceased. 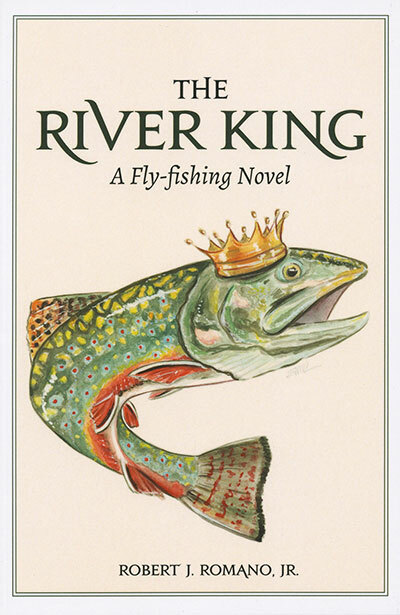 The river king slowly finned back into the depths from where it had risen to strike at the annoying bug with the surprisingly nasty sting. That was the day that forever changed Donnie Gilroy’s life; the storm that caused his river to flow over its banks, creating a flood that turned the river from its original direction down a course from which it would never return.